We are hard at work here at Rezium Studios on a number of projects. Arigon is working on a 12-page story for the upcoming “Tales of the Mighty Code Talkers” from INC Comics that’s due later this year. Additionally, Arigon has completed work on Super Indian Issue #5, “The Curse of Blud Kwan’Tum.” If you’ve been reading — you’ll know the story is in the midst of telling the story of Blud Kwan’Tum and his nefarious origins! Did I tell you I loved your card, Arigon? I reused it for a label on a gift at a white elephant and folks FOUGHT over the package. 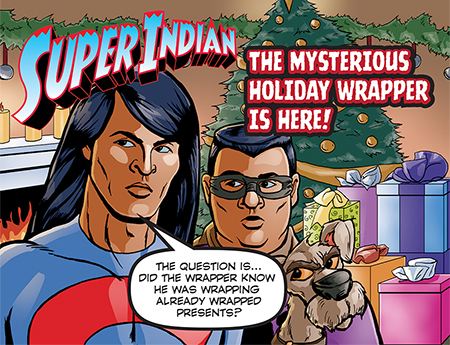 What will you do with YOUR Super Indian Christmas card next year? Next WordPress and Plug-In Woes!